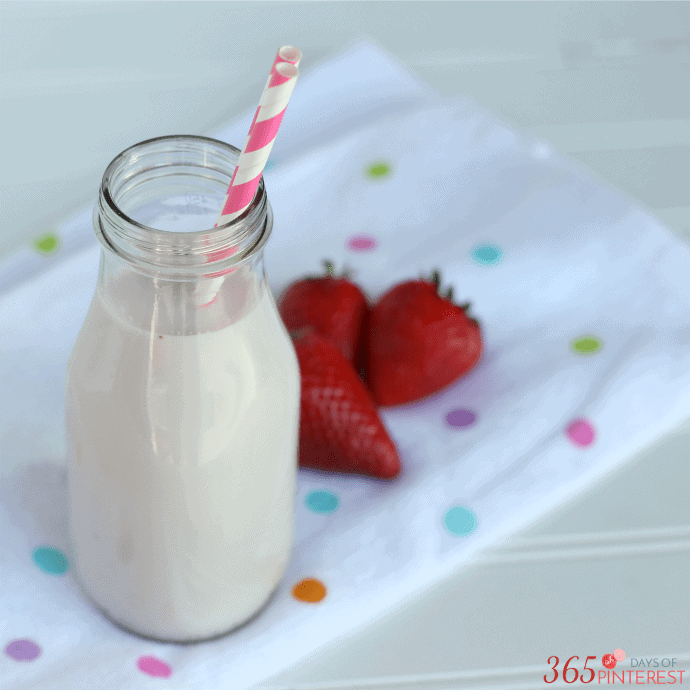 Take a break from adulthood and enjoy a tall glass of homemade strawberry milk. It’s all the yummy nostalgic flavors only fresher, creamier and better! The kids need to visit the dentist again. The sprinklers in the front yard need to be repaired. The car is making funny noises and the check engine light is on. The pile of receipts, old bills, mail and tax records is getting larger and needs to be filed. The Awkward Yeti and this whole brain/heart series is hilarious! Sometimes, you just need to go back to childhood and do something in memory of that blissfully ignorant time of life. Did you ever have bright pink strawberry milk? It was always next to the chocolate milk in the refrigerators at the Haz-it Market down the road from our house. We would ride our bikes down to the market, pick out something with our own money and then enjoy it before our ride back home. Now that I’m a responsible adult, I hesitate to drink something that’s so artificially bright pink and probably doesn’t actually have any strawberries in it whatsoever. I know, just call me a kill joy. 😉 But that doesn’t mean I wouldn’t like the sweet treat! I started thinking about it the other day and figured I would just make my own homemade strawberry milk. Why not? I made a delicious strawberry topping for these Stars and Stripes Sundaes, so I made a thinner version of that as a syrup to flavor my strawberry milk. In a small saucepan over medium/high heat, combine the strawberries, sugar and water. Bring to a low boil and let cook for 10 minutes, stirring occasionally. Cook until the mixture is slightly thickened and most of the color is out of the strawberries. Strain the content of the pan into a small bowl, using a mesh strainer. Set aside the strawberries to add to yogurt or pancakes! Let the syrup cool. Pour two glasses of milk (one cup each) and add the syrup to the milk. I used just under 1/4 cup of syrup for each glass. You can use more or less, depending on how sweet you want the milk to be. Save the leftover syrup for more milk, or add it back to the strawberries and use it on waffles! If this homemade strawberry milk makes you want to try other recipes with belly-friendly a2 milk®, try one of these easy and delicious recipes! 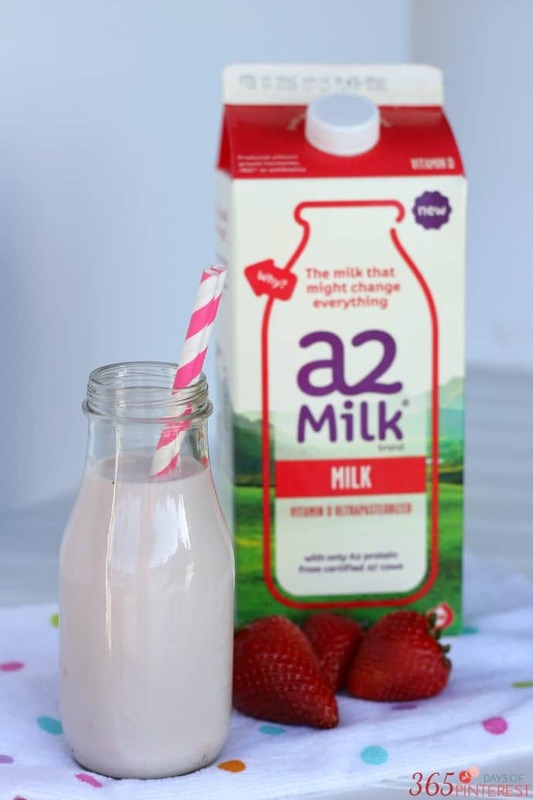 If you’d like to try it, you can save money with this a2 Milk® $1 Off Coupon. Right now, a2 Milk® is only available in California at Ralph’s, Sprouts, Whole Foods and other stores. But they are working on expanding to nationwide and you can check their Product Locator for updates. For more great recipes and information, check them out on Twitter, Facebook and Pinterest. Great idea! We don’t drink much other than water, but this is fabulous especially if trying to transition into a whole foods diet and getting rid of artificial colors, sweeteners, etc. 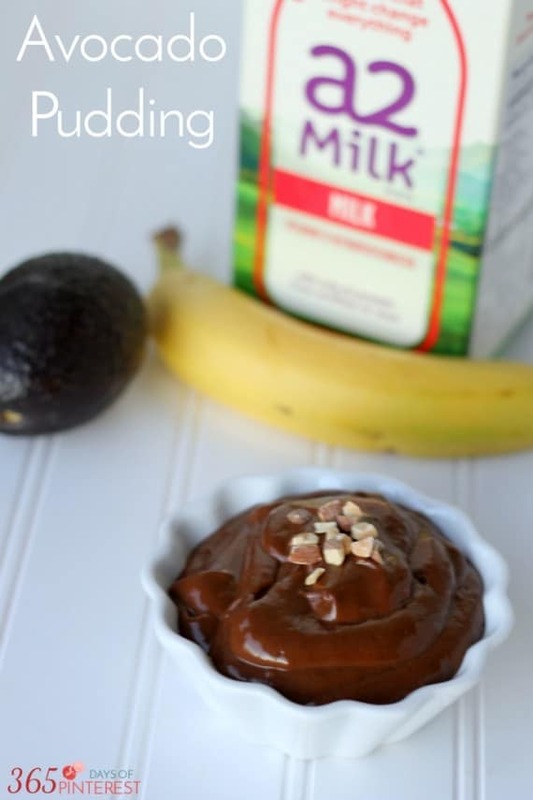 I also saw the avocado pudding pic – although this looked tasty when I made it, knowing it was avocado just didn’t appear to me. We used it as a fruit dip, but I didn’t make it again. Maybe we’ll try again another time….. I have never had strawberry milk! My husband and both boys have lactose intolerance – We’ll have to look for A2 Milk in the stores when we get to the US. Thanks for the great strawberry milk idea! I used to love the strawberry Yoohoos. It tastes exactly the same as “regular” milk to us! (not strawberry milk- the a2 milk) HA! 🙂 My husband was a big strawberry YooHoo fan, too. He heartily approves this new recipe! Oh yum! 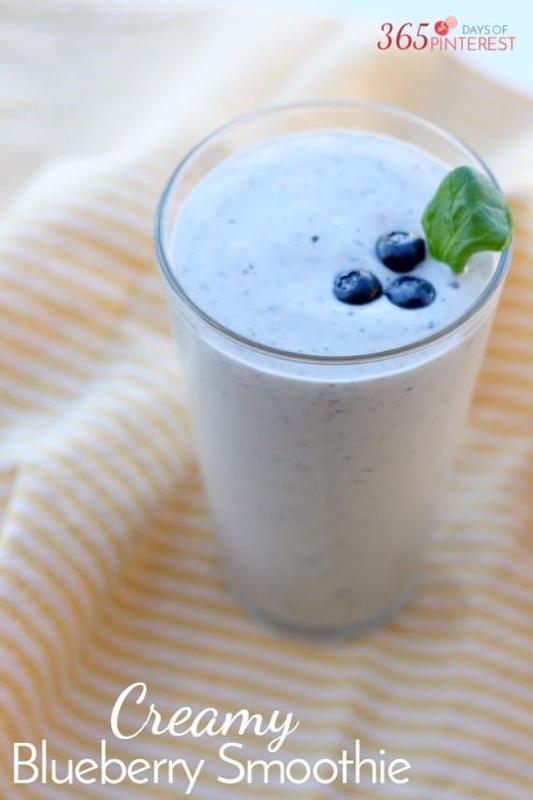 This looks like a delicious afterschool snack! That sounds yummy and so much better for you than the other kind. 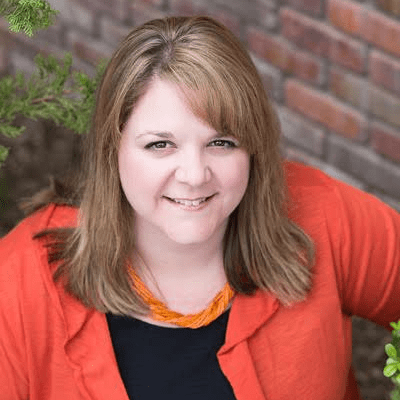 I’d love for you to link up to our link party going on right now at Fearlessly Creative Mammas. It’s open until Friday. Pinning and sharing on my FB. Thank you! I’ll add your party to my list and do my best to stop by this week! This looks really tasty! 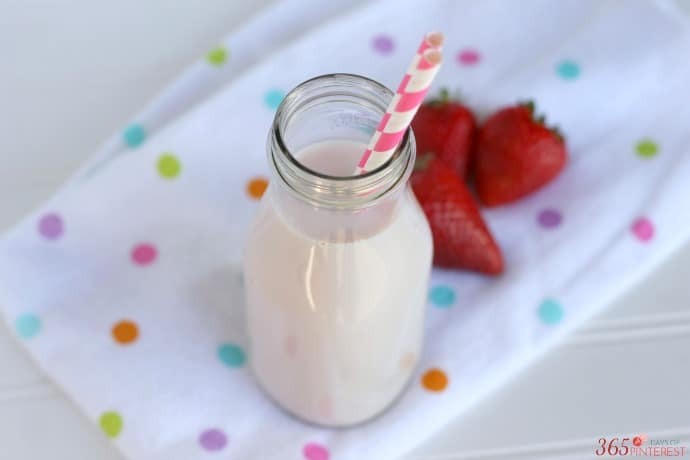 I love strawberries, and I love milk, so this is a perfect combination. What a great idea! 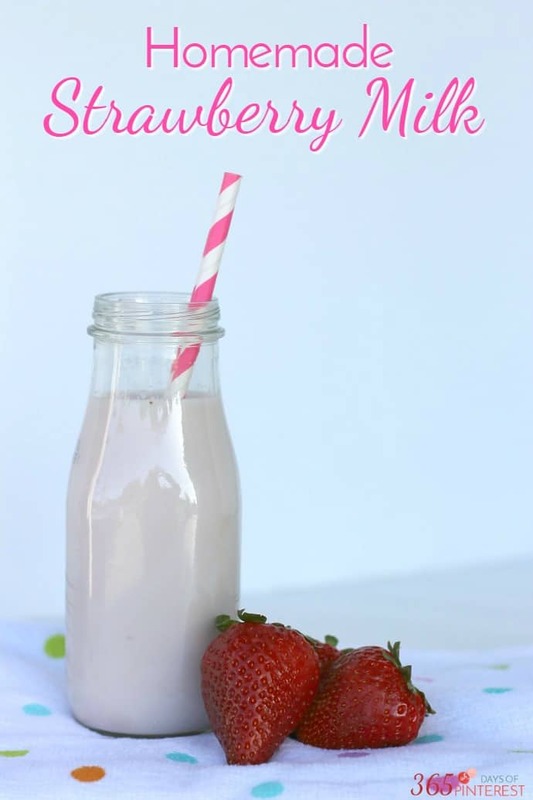 I would have never thought of using fresh strawberries to make strawberry milk. It sounds healthy and delicious. A little bit of strawberry is the only way that my daughter will drink milk! We don’t have dairy issues, but it is great that these types of products are available for those that do. I agree about all the sugar…so this is a great option for sure. And actually tastes like berries. I bet this amazing with real strawberries!